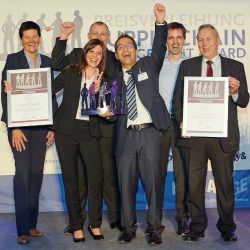 Peri Group, the German formwork and scaffolding specialist with operations around the world, has won the Supply Chain Management Award 2016 in Germany. The multinational sells, rents and refurbishes formwork and scaffolding systems for construction projects of all types and scales. Four finalists pitched their project during the Exchainge supply chain conference in Frankfurt am Main in October. Peri emerged as winner for its closed-loop supply chain project and the development of a planning process for that cycle. 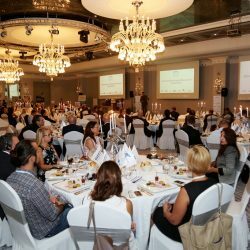 His relatively young yet very impressive colleague Ramona Held explained that her company has developed its own planning game to bring a multifunctional team together around the same table. Because SAP ERP does not support rental business, Peri has implemented Qlickview software to share data with all parties in a construction site’s supply chain. “We now use uncertain elements with probability statistics for our production and procurement planning,” Held explained. As a result of this project, the use of resources has improved by 18 percent, and refurbishment has prevented the manufacturing and procurement of equipment to the value of EUR 28 million per year. “This saves the equivalent of 100 blue whales in carbon emissions each year,” stated Rosenkranz proudly. Adrian Kaczmarczyk, Corporate Vice President Global Supply Chain at Henkel Adhesive Technologies, presented the company’s four-year project to reduce supply chain complexity. Henkel applied customer segmentation and transformed the one-size-fits-all supply chain into a service strategy catalogue with an accompanying dashboard. Based on scenarios and with help from consulting firm Barkawi and Llamasoft, the supply chain team has optimised the global warehouse footprint. Henkel has been able to reduce the number of warehouses from 317 to 249 worldwide and is aiming for a target of 216 by 2020. Joachim Ley, Executive Vice President Supply Chain at Recaro Aircraft Seating, elaborated on a lean project in the greenfield factory, resulting in a 25 percent reduction in lead time. 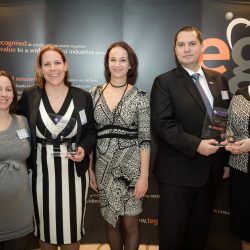 The Supply Chain Management Award is an initiative of consulting firm PwC and the industry trade magazine Logistik Heute. Past winners have included Nokia Networks (2015), GF Piping Systems (2014), ADVA Optical Networking (2013), Infineon Technologies (2012), BASF (2011) and BMW-Motorrad (2010).